Overhead projectors are great for acting out myths and ancient stories from world religions. With the help of transparencies children can let Moses part the Red Sea, make water rise in a Native American flood myth, let Jesus walk on the water, and have lotus flowers sprout in Siddhartha’s footsteps. In this post a few examples of the use of an overhead projector applied to Greek myths. One way to indicate the difference between a deity and mortal person is by size. 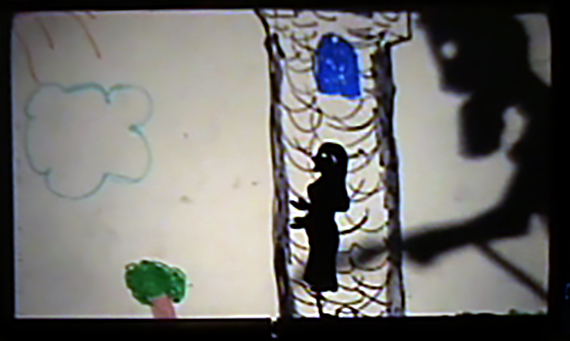 In this example 4th graders acted out the story of Zeus falling in love with Danae, who was locked in a tower, drawn on a transparency sheet on the overhead projector. By putting the top part of the puppet of Zeus on the overhead projector, then slowly moving him to Danae on the screen while staying in the beam of light, children imitated Zeus descending to earth. You can create the effect of a boulder rolling uphill by folding a pyramid out of cardboard or card stock paper and putting it the overhead projector. Make a boulder by cutting a piece of sponge in the right shape and attach it to a piece of thread. Put the boulder at the bottom of the cardboard hill on the projector and pull it up while the student behind the screen pretends to push the boulder up the hill. In this story of the goddess Artemis and the hunter Orion, Orion is shown as a constellation in the sky after his death. The effect is created by using a blue transparent divider from an office supply store on the projector, attached to an additional clear transparency. The shape of Orion is cut out from the blue transparency while holes are punched for the stars. 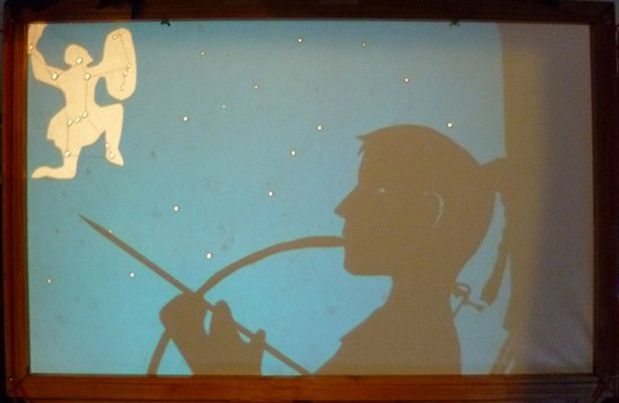 In this photo, the puppet of Artemis is also put on the projector. Overhead projectors are great for acting out any constellation myth. In this 4th grade performance children drew an picture of Pegasus on a transparency, based on online image research. The transparency on the overhead projector was slowly replaced by a sheet of black paper, in which the stars of the constellation were punched out. 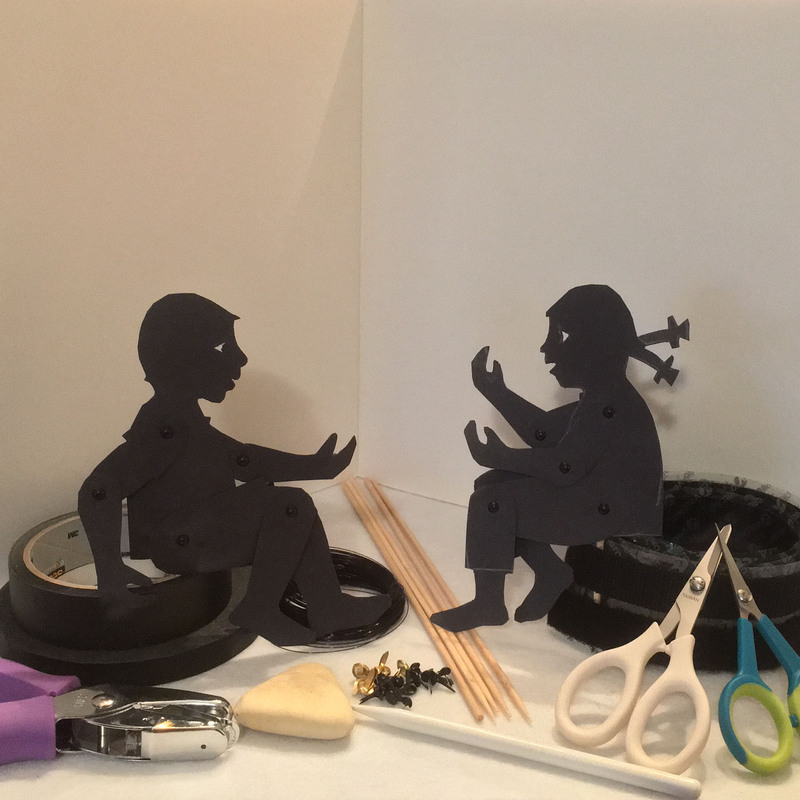 To create the illusion of moving, you can build a rolling rack following the instructions provided by David and Donna Wisniewski in Worlds of Shadow, Teaching with Shadow Puppetry. The background is drawn with permanent markers on transparent film. In this footage Charon is rowing Orpheus, who is playing the lyre, across the river Styx to the Underworld. To increase engagement with the children, the boat and puppets were attached to the front of the screen while children handle the moving rods.